Two weekends ago I had the most amazing morning photographing the migrant birds at Fort De Soto. The trees were literally dropping with colorful birds. Red tanagers, orange orioles, blue buntings and grosbeaks, and warblers everywhere. It was a birder’s paradise. Good birding isn’t always good for the birds. Most of these birds spend the winters in South America. In April, they fly north to their breeding grounds in the United States and Canada. Many cross the Gulf of Mexico, flying nonstop across the ocean in an incredible journey. They take advantage of the winds to make their flight easier. But when they encounter a front, their tail winds suddenly become headwinds, which can be deadly for the birds if they are still over water. They land as soon as they can in what is called a “fallout.” Fort De Soto is a place where such fallouts sometimes occur. 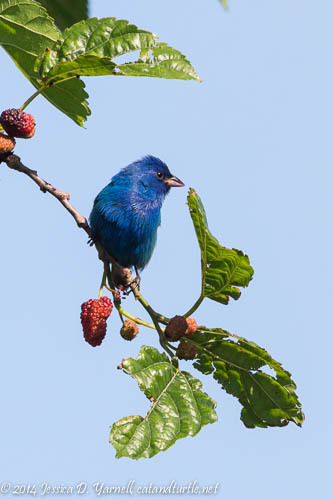 It offers the birds land, trees, fresh water, and a food source – mulberries. If you’re like me, you may have visited Fort De Soto several times and never known where the famous “mulberry trees” are. Well, they are by the ranger’s house. When you pull into the park, turn right at the flagpole. Drive until you see signs for the Bay Pier. Pull into the first entrance to the Bay Pier and park. You’ll see the ranger’s house on your left. The trees around the house are the migrant trap. At this time of year, you’ll see lots of birders and binoculars. A big thanks to the park rangers for tolerating the happy birders so close to the house! When I arrived at the mulberry trees, they were literally crawling with birds. It was so much fun to watch. It was so easy to get pictures of so many species. 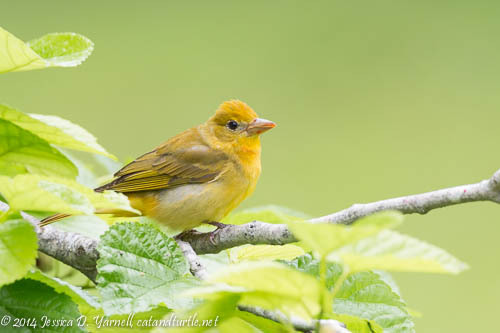 Within minutes, I had both male and female Orchard Orioles, Baltimore Orioles, Scarlet Tanagers, Indigo Bunting, Blue Grosbeak, Summer Tanagers, Red-eyed Vireo, Cape May Warbler, Hooded Warbler, Palm Warbler, Prairie Warbler, and more that I’m probably forgetting. At first I just tried to get identification shots, since I’ve only seen most of these birds a few times. 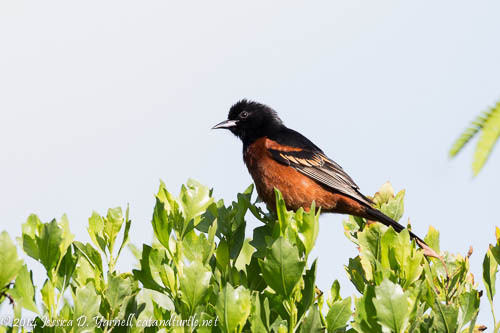 The orange Orchard Orioles thought that the trees were their own personal property. 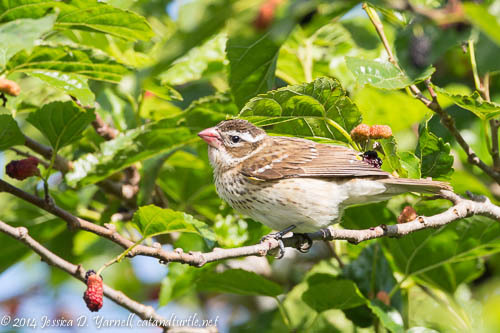 Even though they were significantly outnumbered, they tried to run off every other bird that was eating the mulberries. It was funny to hear them fussing. They didn’t have much luck in keeping the trees to themselves, though. Everybody was hungry! If you want to try to attract the orioles to your backyard as they pass through, try putting out a sliced orange. The orioles drink the juice. Add a spoonful of jelly and they will be happy birdies! I was surprised at how many Cape May Warblers there were, and just how friendly they were. They would hop to the branches right over my head. I was really happy when one hopped down to a mulberry right in front of me. He chowed down, and spent so much time eating that I finished with my stills and switched to video mode. The video above certainly conveys the intense feeding that all the birds were doing. The warblers are the most challenging to photograph during the migrant fest. They tend to stay at the tops of the trees, and it’s really good if you have a flash and a Better Beamer to get some light up on them. They are also rather hard to spot, so it’s nice when you’re with experienced birders who can point out the rarities for you. 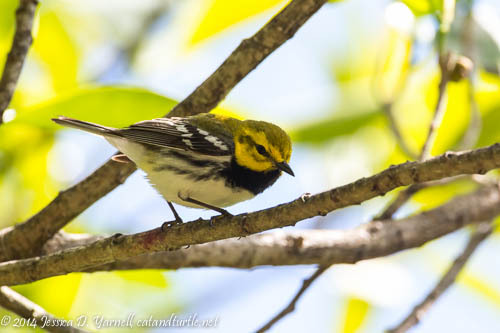 I was very surprised when this Black-throated Green Warbler hopped out on a low branch and posed for my camera. This was my first Black-throated Green in Florida, although I did see them in Maine last summer. 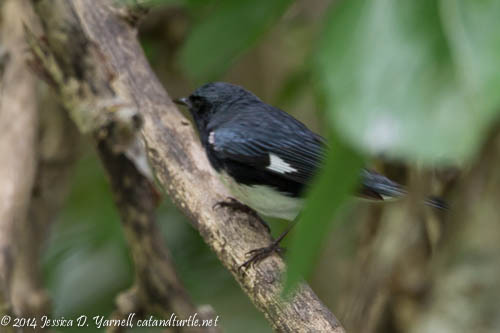 The Black-throated Blue Warbler wasn’t as cooperative. I saw several of these guys before I got even a decent identification shot. They are fast! They’d pop out for a second, and before I could focus, they’d flit back into the tree. Silly birds! Why are all lifer shots bad? :) But I don’t add birds to my life list unless I’ve photographed them, so I had to add this one to the blog to make him count. Ruby-throated Hummingbirds are some of the tiniest birds to make the long migration across the Gulf. They lose over half their body weight in their overnight crossing, and by the time they reach land, they are depleting their muscle in order to survive. So it’s no wonder that they were all over the lantana growing around the mulberry tree area. The lantana provides them with the nectar they need to regain their strength for the next part of their journey north. This male had clearly been very active feeding that morning, as you can see from all the pollen on his forehead! As I walked around the mulberry tree area, I was surprised to look up and see this Eastern Wood-pewee posed out in the open at the top of a tree. 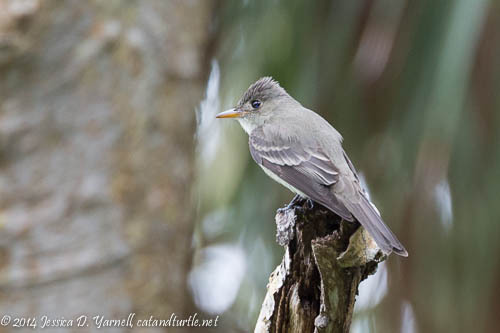 I’ve only ever seen one other Eastern Wood-pewee, at Circle B a few years back. It was great to get a better look at him. But just for a moment – I got two clicks on him, and then he flew! The morning went on and I got more careful about my photography. When you first enter Migrant Paradise, you have the tendency to snap a picture of everything that moves. After you get those ID shots, you can start looking for less cluttered backgrounds and more pleasing perches. I moved along to the East Beach Woods. At the park’s entrance, turn left at the flagpole, then turn in at the second entrance to East Beach. The trees are wonderful for migrant birds. There’s a mulberry tree over there, too, and well as an oak tree that I’ll call Tanager Tree. 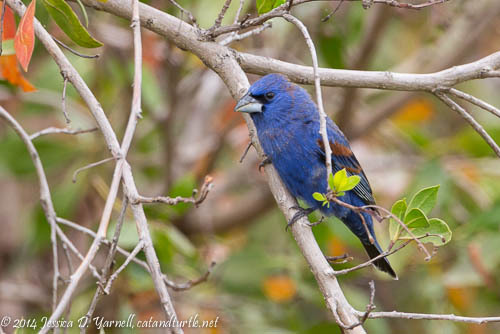 It’s at the entrance to the Privet Trail and it held no fewer than 10 tanagers on this particular morning. It was incredible to watch them as they perched, looked for insects, then dove to catch their prey in mid-air. 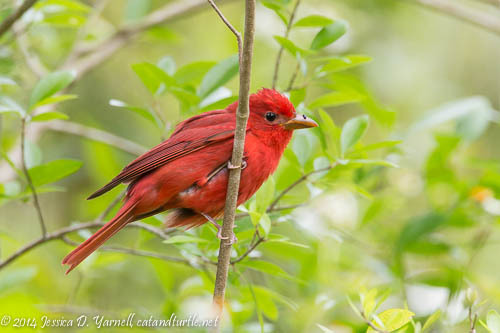 I was thrilled to score my first male Summer Tanager, the only totally red bird in Florida. Yeah, you may be thinking that your backyard cardinals are totally red, but if you look closer, they have a black face. The male Summer Tanager is truly red all over. I’ve photographed the female before, but not the male. I took a loop around the East Beach turnaround before leaving, and found my lifer Eastern Kingbird. 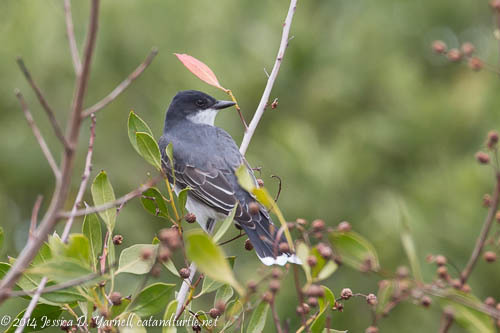 The Eastern Kingbird is actually a summer resident in Florida, but I’d never seen one before. Talk about the icing on the cake of a great day of birding! A really good resource for bird migration information is the Birdcast website. I subscribe to it in my RSS feed. 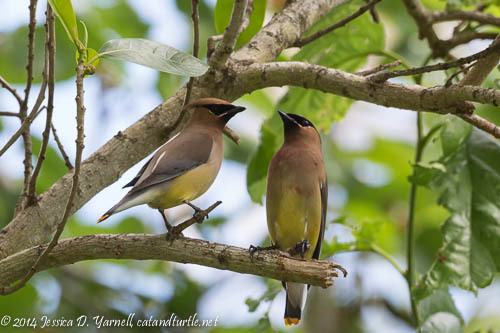 During spring and fall migration, they blog weekly to indicate which birds are on the move, and when the weather conditions are most likely to be favorable for birding. I learned that not all migrants fly at the same time. The birds that nest farther north move a few weeks later, since their summer grounds may still be getting bad winter storms. Smart birds! This year I’ve also been following the blog of Dorian Anderson, who is doing a Big Year on a bike. 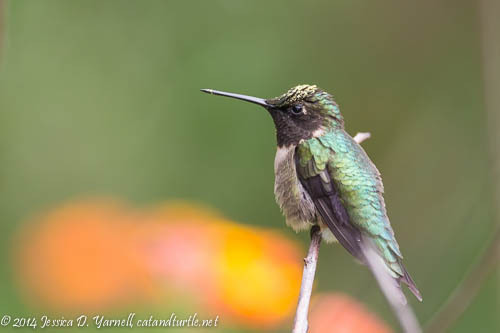 His blog is fun to read as he sees all these different birds across the country. Check it out! Icing on the cake? This is the cake, icing and ice cream to go with it! What a fantastic day you had!! So many great shots! You had a great trip. Give me a shout if you are heading back this way. Wow, I was obviously there on the wrong day! What gorgeous photos! That’s awesome that you had so many lifers, too. A great day, indeed! What a wonderful site. Thank you I was able to identify a new brown bird to my yard a Brown Thrasher. I loved the descriptions of each bird, and then I saw all of your amazing photography at Fort Desoto. I didn’t realize that many birds migrated through here. Thank you so much! Thank you, Stephanie! Glad my site is useful. We have a Brown Thrasher that visits our yard in the spring too.